Nope, thanks I got it, just clarifying. A candy store! I'm not a huge fan of copies (homages) but that is quite a bit of watch for the money. They do a popular 6105 copy too. I have turned into a watch hypocrite in an instance And I have little excuse for it because I have enough knowledge to realise that this 'Sharky 62MAS' is not just another vintage looking dive watch. 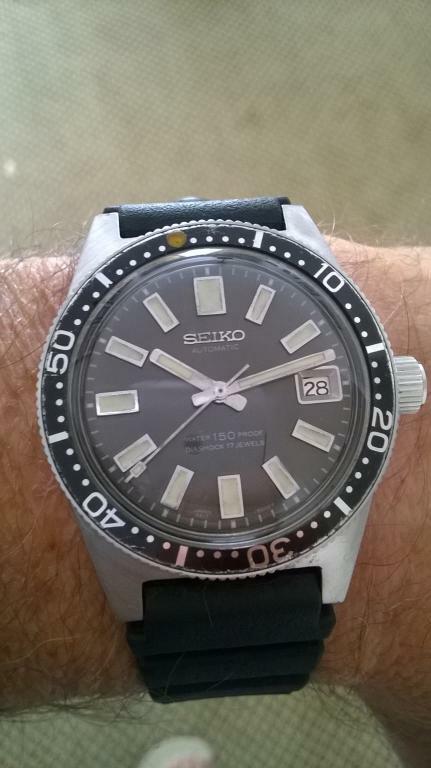 But a more or less successful copy of a now very famous (in watch nerd circles) Seiko product. And yes, I will perhaps buy another one of their offerings. I have been eyeing another 6105 homage from a very small Indonesian micro brand but that is almost twice as expensive while it's basically the same watch. Good luck. Man doesn't live by IWC alone! Heimdallr 62MAS Sharky, try eBay. A fine combo indeed. Looks like a nicely finished buckle on that strap too. Awesome piece with classic looks. I like it. The first minor 'flaw' has emerged. And this has all to do with the choice of movement (or just related to the movement in my watch). The date roll-over starts over one hour before midnight. 22.50 to be precise. The accuracy however is that good that I almost not dare to mention it in fear that no one will believe it. After four days of wearing the watch from ca. 08.00 to 19.00 it is plus 6 seconds. I place it flat on a table, so not crown up or down after I take it off. That is almost exactly when the 4R35 movements I own start the rollover. In fact it starts a bit before that if I'm really being exact, like at 22.40. I'm no expert believe you me, but isn't the NH35 basically the resale version of the 4R35? If not for being an extremely boring task I would take a look again tomorrow Not! It must lay somewhere between those figures but at 00.05 the next date wasn't fully aligned yet. Whatever, I'm extremely happy with this watch and can wholeheartedly recommend it! It's very stylish and Seiko have done a great job in creating the original. As for the movement, I was surprised to find out that the 4R35 was only introduced 9 years ago. The NH35 could well be an OEM version for brands like Heimdallr. ETA versions are becoming very hard to source and have become too expensive to pop into a $170 watch. I have date alignment problems with the 4R35, too. Usually, after a period of non-wear (I have no winder ) I tinker with dialing the alignment in just so, then get driven partially mad as I screw in the crown and it jumps back a little off center. I then repeat the process until I get it right, then if I continue to wear the watch it consistently remains aligned. I guess this should tell me to get a bloody winder already. That's good Seiko accuracy for you. My 62MAS is 52 years old and was running at +2 spd when I checked it 2 weeks ago - quite incredible. Wow, the real deal. Are you willing to post a picture of your 62MAS so I can compare the two? A local collector offered me a LNIB Tudor BB 58 as a straight swop from the 62MAS. Tempting indeed. Handsome watches gentlemen. Reflex that is quite a problem you've got on your hands. Is that strap real vintage also? That's amazing.